We have had a ceramic knife here and there but never a three piece set and certainly not a whole set yet but I have to say these knifes are super sharp, very surprising when you are used to stainless steel knives. I love the sleek matte look of the knives they go with my kitchen well. I am currently looking for a nice knife block to store them in but super glad they came with a nice box to store them in between uses and until I can find a block for them to fit into. 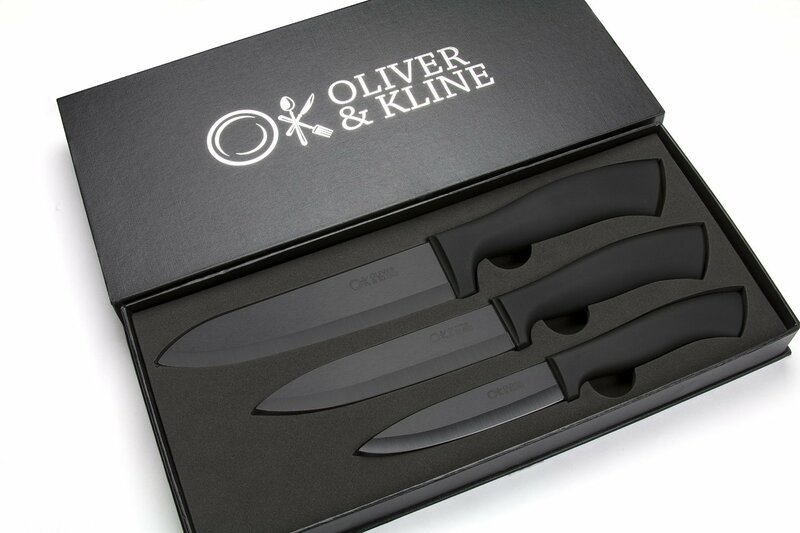 You can find the Oliver & Kline Ceramic Knife set on Amazon. What Oliver & Kline have to say about their product. Have you ever used a ceramic knife before? If not, you're in for a treat. These things effortlessly slice through anything in a way that traditional knives do not. In addition, they hold an edge longer than any other type of knife you may have used previously - we're looking at you stainless steel! Plus ceramic knives never rust and are easier to clean. The real question is - why this ceramic knife set from Oliver & Kline? The answer is this: functionality + style + personality. Usually, manufacturers either make something pretty that doesn't work... or they make it work yet it's ugly looking. We went the extra mile with these knives so you have something you can proudly display and easily use! Even more important - we're not a faceless corporation... we're a small business run by caring people whose mission is to achieve 100% happiness in each and every customer. See for yourself how attentive we are to your needs after you purchase today!